For over 30 years, A&A Towing has specialized in the area of Private Property Towing and Impounds in Long Beach and surrounding cities. We provide exceptional 24/7 tow service in Long Beach and surrounding cities to multi-housing, residential, commercial and HOA communities. Through experience, we are able to work with you and law enforcement to offer you customized solutions and help you manage and enforce your parking guidelines. You establish the rules and we perform the service for you. Tow Away Signs which are in full compliance with CVC Section 22658A regulations and installed and maintained at no cost to you. Provide Parking Permits upon request. 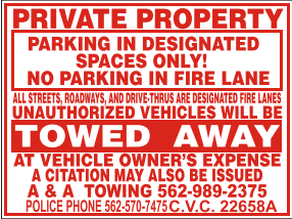 Prompt removal of vehicles blocking fire lanes/ garbage dumpsters / garages / no parking zones. Relocation of vehicles for parking lot resurfacing/maintenance repairs. Stand-by Tow Truck services in Long Beach for special events. We understand that parking enforcement can be a sensitive area of Property Management. Choose a towing company that does not add to your towing issues, but becomes a part of your team with great solutions. Our highly trained and experienced staff adopts an attitude that focuses on compliance and offers a fair resolution to all. 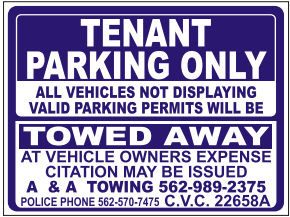 Utilizing our parking management and towing services will increase the security of your property and tenants.